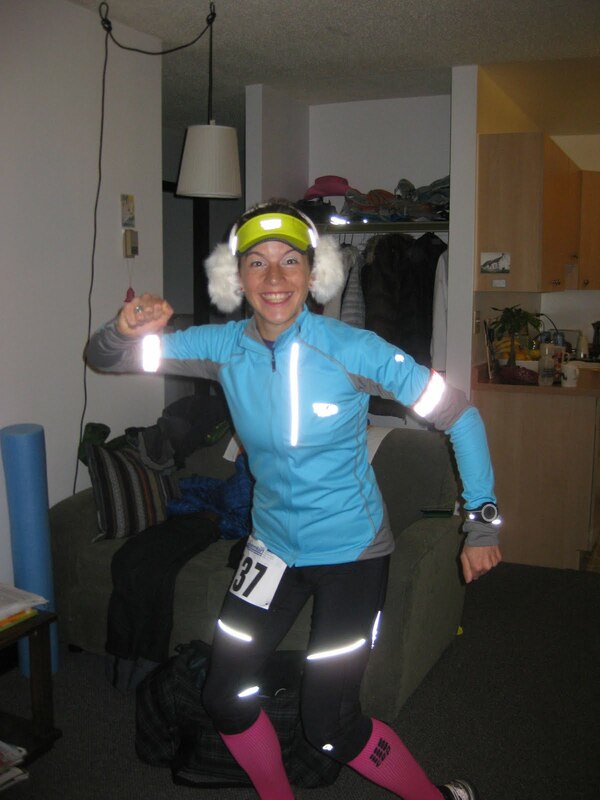 Endurance addict embraces the snow! View from my apartment today's winter wonderland that is Banff. Being a runner in Banff has it's benefits for sure - living at 1400m sure is awesome altitude training, and the network of stunningly beautiful trails in my backyard ain't half bad either. But I spend a good portion of my year hauling myself out of the door in the cold and snow and just dreaming of green trails and temperatures above zero. 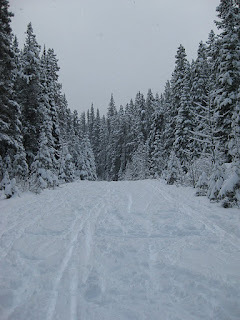 Yep, I like to ski - but in my heart of hearts I'm a runner who just wants to run on snow and ice free roads and trails. I love snow (on skis or snowshoes, but not so much in running shoes)! 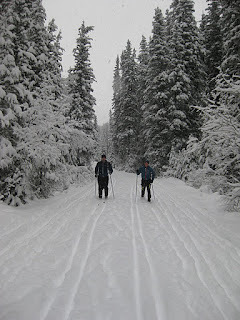 But I'm trying to make the most of the weather and I today I made it out cross country skiing with 2 friends, probably the first time I've cross country skied in a good few years. My technique is bad but it was so much fun just to enjoy the snow as it was coming down all day and was truly a winter wonderland. That said, of course my outing also had a slightly ulterior 'training' motive. Being an endurance addict I ignored all better judgement and signed up for a cross country ski loppet this past week. Race day is nicely soon enough - Jan 22nd - time to get some skis on and practice a bit, yet not too far away that I'll have time to get overly concerned with the details, and done before I need to really start being concerned too much about long runs (important given I now work a 48hrs/ 6 day work week, so have one day a week to get long runs in). Oh, did I mention that the loppet is from Lake Louise to Banff. It's only 72km :) It'll be an experience to say the least I'm sure. Bring on the snow! Find my race report of my final race (promise!) of the year by clicking here. m for their awesome coverage of the race as it unfolded on twitter as well as the great post-race analysis. You think you run a lot? Well did you run 250 marathons last year? 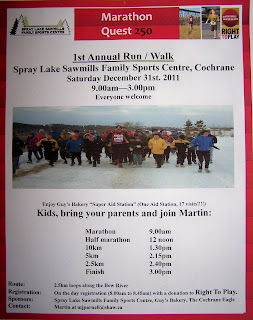 Martin Parnell, a wholly unassuming Brit living in Cochrane, Alberta did in 2010, and all to raise funds for Right to Play. 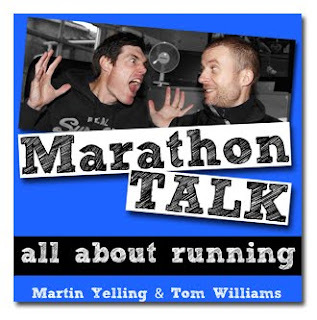 I had the pleasure of meeting Martin at Comrades this year andhave seen him a few times since and the more I have chatted to Martin I am amazed about his dedication to raise money for Right to Play through setting up amazing challenges without the aim of self-promoting whatsoever. He just appears to love to run and loves to inspire kids to be active. With needing to book vacation time off work and with ultras now typically selling out months in advance it always comes to this time of year and I start sitting down planning what races I might do next year. Of course, it is hard to plan so far ahead sometimes but in a sense sitting down and thinking about what I want out of my running year, what goals I would like to achieve and what courses I would like to experience and challenge myself against is a good thing to do for any runner. The list I have come up with for 2012, now it is down on paper, looks pretty ambitious to me! If I do actually realize all these races then it will be an action packed and demanding 12 months for sure. Maybe I am trying to bite off more than I can chew, but on the other hand, if my body and mind are able to do all of this, it would be a dream. I have tried to choose races that complement one another, races that are a mix of old favourites with less pressure and more about sharing good trail times with friends, to big goals that I have no idea how they will pan out and even if I can achieve them. There are quite a few races which are repetitions from this year, which may seem odd but to be honest, any racer learns a lot from the first time completing a course and so some I would like to go back to with my new found knowledge and see if I can improve. April 22nd - London Marathon, UK. ... I also have 2 or 3 other races September onwards that I am eyeing up and have pencilled in, but will wait and see a little on those. 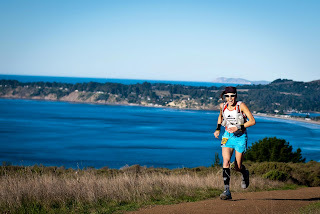 Oh, and as for Chile being my last race of this year.... all I can say is that I have zero will power, that Chile reinvigorated me to hit the trails and have pure and simple fun, so I look forward to lacing up my Montrails and seeing how I do in the Marin Headlands in 2 weeks time. On Monday 28th November I'll be speaking at Ultimate Fit Centre in Canmore about Winter Training. Come along for some useful tips and advice on how to brave the dark, snowy and cold winter months yet keep your training progressing. The evening runs from 6.30pm to 8.30pm with my talk, Q&A session and then a chance for some shopping!! Hope to see some of you there, and if you know for sure you are coming, please comment on this post so we can plan for numbers! 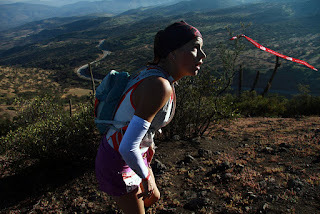 Ultramaraton de los Andes, Chile - ESPECTAULAR! Yesterdays 'Ultramaraton de los Andes' 50 miler in Santiago, Chile has to be one of my most fun races of the year, which is really saying quite a lot given how much fun I have had this year. But with this being my prize from winning the Canadian Death Race in 2010, it being a real destination race and one to wrap up the racing year with, there was a lot less pressure than at most other races. It was great to be in Santiago with quite a few of the North American North Face athletes (TNF are the race organizers/ sponsors) but really with most of the field being Chilean or some other South American nationality there was not the usual expectation of who might win, who might beat who etc. North Face did a great job of adopting me as the lone Montrail/ Mountain Hardwear athlete for the weekend so there were fun times even before the race with team meals, a group run with the local TNF store runners and they even picked me up from the swish W hotel at 3am to take me to the race start, just a 20-min drive from central Santiago. Having spent most of the summer training for World 100km and then having followed that up with Run for the Toad (trails, but flat trails) I knew that I was unprepared for the over 4100m of climbing (plus same of descent) that this race would encompass, but hey ho - I'd done a few Sulphur hikes, a scramble up Rundle and a slow slog up Edith/ Cory pass in Banff in the few weeks prior to at least warn my quads that they were in for a beating. With the race starting at 4am we had a good 2.5hrs in darkness. 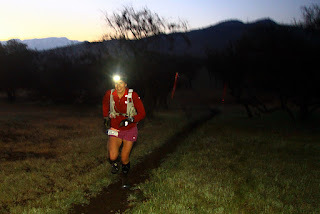 Just like at Western States I used both a headlamp and a handheld flashlight and was glad to have both. It's always amazing how dark it is out on the trails even with fellow runners all with flashlights around. We had about 5km of flattish trail to start and then the first of the major climbs started with avengance. It was hands on the quads, try to look up, and keep on going. I was in a small group of men and knew I was lead female but was just focusing on the climb. It as actually over pretty soon, we crested the top and began a steep 'a la Canadian Death Race' descent. Sometimes it was definitely a case of just going for it and hoping you stayed upright on the shrubby grass and loose soil. The maple leaf flag on my hydration pack (code - 'I'm Canadian - please speak to me in English if you can!') soon paid off as I struck up a conversation with John Tidd, an Argentinian/ American runner (who ended up placing 2nd male). I was soon surprised that Ian Sharman joined in the conversation in the inky darkness of our descent, Ian had come into the race tired and was already resolving to make the smart decision to drop. He played along for a while though and ran with me, which was good to have some conversation and company. However despite this early company by about 22km I somehow ended up totally on my own. It was cool for a while, I was soaking up the fact that I was running through the Andes in the darkness all on my own and could just about pick out the silhouetted mountains. I don't think I have ever focused on course flagging so much, the trail was not really much of a trail and often sent us randomly up or down scrubby grass slopes in a slightly haphazard fashion, it was certainly not a case of just follow a well marked trail. As Tim (Twitmeier) would say after, 'what was the deal with the cow pat field?!' and indeed, I saw a few cows (including one dead one! ), a few stray dogs and I learned the lesson for not speaking the native tongue when some marshals called out to me something I didn't understand in Spanish, before I promptly ran into a muddy/ cow pat filled ditch. Awesome! After some time of running alone I just hoped I was still going in the right direction. Yes - I was following the flagging but I also remembered that we would intersect with the 50km course and hoped that I somehow hadn't gone astray and onto that course. But no, I soon came across a course marshall sitting all alone seemingly randomly in the middle of a cow pat field. In the dark. Well, it seemed like a slightly odd marshalling point, but at least I was comforted that I was heading in the right direction. It was good also to have to get a little 'passport' clipped at 12 points along the course to ensure that no one cheated, but it also reassured me that I was always on course. It was surprisingly chilly, I had taken off my gloves but as we descended a bit the moist air had got trapped in the troughs of the landscape and I popped my gloves back on and kept my jacket on til after 8am. There was even frost on the ground in sections. However as soon as the sun came up the temperatures began to climb along with the terrain and I began to ensure that I was taking on enough liquids and gels/ shot bloks/ salt. As well as the 'passport' check points there were aid stations en route which were well stocked and well manned and I soon fell into my routine conversation of 'Hola!' 'Gracias!' 'No hablo espanol! ', which was either greeted with some helpful English and a smile, or some weird look of 'Who's this foreign woman running around like an idiot?' (there were definitely far more men in the race than women, and I would guess that a good chunk of the marshals were not runners, and certainly not ultra runners). As the terrain climbed the views became more and more spectacular, the muddy cow patch section (which had resulted in feeling like you were running in platform shoes of mud at times) was long forgotten and it was a case of hike, hike, hike. As someone who tends to do more runnable courses I felt like I was moving so slowly (I was) even on some of the flatter sections (which were traverses of grassy hillsides with no real level trail as such). I was convinced that runners would be catching me but no one did and at that point in time I wouldn't have cared if they had. I was running in the Andes, I was looking down over the shiny skyscrapers of Santiago and across to the snow covered mountains on the horizon, there were cacti on the trail (note to self, do not use Andean foliage to hold onto - it will hurt). It was quite simply stunning. It was around the 50km mark that I began to catch the slower of the 50km runners. Having been on my own really since I left Ian (about km 22) it was nice to see other people out enjoying their day on the trail. The aid stations also began to seem closer together (they had been quite far apart in the first half of the race) which was great as I was trying to drink from those and not have to waste time in refilling my Nathan pack (and just use it for sips between the stations). I was! I hit a gravel road climb and up and up I went. Hmm, should have looked at that course profile map in more detail! 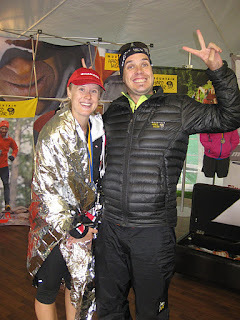 Fortunately it was around this time that I happened upon Marcello from TNF Brazil. Despite not being able to communicate much we both realized that the other was tired and began to death march up the road together side by side, once in a while exchanging a few words or I would show him my garmin so he could see what km we were at. With the gravel road climb over I again I thought that maybe the climbs were over but I can honestly say that they never were until right at the finish. Up and down and round and about the trail would twist and turn as we occasionally crossed roads or went through urban parks with bemused Santiagians out walking there dogs and enjoying a leisurely Saturday. However at least in hitting this more urban section, we were buoyed along by crossing paths with some of the 10km and 21km runners, as well as aid stations getting even closer together (great as it was now turning into a sunny Santiago spring day). With the course marshals having been efficient but relatively unenthusiastic most of the day it was a welcome change to see one who started shouting at my in crazy Spanish. I just about made out that I was first female (ok - I know that and I am trying to hang on, convinced that I must be getting caught at the slow pace I am going) and also that I was third overall. He was clearly excited by this and it gave me a little buzz to keep pushing for the final 5km or so. By this point my garmin had died so I couldn't check how close I was getting to the finish line, but it seemed a very long 20km from the 60km mark when my garmin had still been working. Ok I was tired, ok I had lost Marcello by this point (and had briefly caught a glimpse of John Tidd who powered ahead as soon as he saw me behind him!) but even so..... the kms seemed long (and indeed they possibly were as someones garmin read 85km at the end). But soon I saw a '2km to go' sign and well under a km later I saw the '1km to go' sign - no complaints about those short markings! I pushed to the finish despite the legs feeling the climbing of the day in them, and crossed over the finish line in 9:42:18. Somehow (maybe I've not done as many ultras as I think) this is my 3rd longest (in time) race to date! 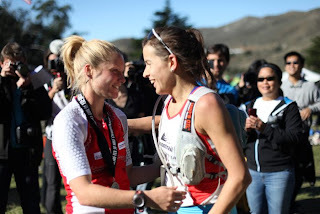 All in all a HUGE thank you to the awesome TNF race hosts who welcomed me to Chile and ensured I had a super stay and amazing race experience. And once again a big shout out to my favourite shoe company around, in yet another race my Montrail Fairhavens saw me from start to finish without a hint of pain or a blister. For more info on the race click here. th table decorations in the marquee for the post race meal? Or how about one with a bagpipe parade before the race? This year there were even toad shaped chocolates being handed out! Montrail/ Mountain Hardwear are one of the main sponsors of the event so it is always fun to come and hang out at the booth at the expo to chat with fellow runners and to see the latest shoe and clothing line up for spring. And there is some pretty sweet running gear coming out! Race day was surprisingly cool to start with. At least it wasn't raining but it had clouded over and the wind was picking up as the 0930am start approached. I knew I would overheat but I couldn't resist starting off in my Geist jacket and gloves, knowing that I could ditch them at one of the aid stations or back at the start/ finish area (as the race consists of 4 x 12.5km loops). And yep, by about 3km I was warming up and pulled off the layers. I had settled into a nice little group with Andy and Daryl and was surprised to see that it took just over one loop for the first 25km runners to pass us (they started 10mins later than the 50km). Taylor Murphy set out well in the lead and another guy had also went out ahead so our little pack were positions 3 through 5. I know not everyone likes the idea of a course with 4 loops but I find it a great way to split up the race as in addition to each km being marked you can mentally check off each loop as you go by. Plus there are so many other great things about the Toad that even if the course it pleasant rather than spectacular, I just can't help keep coming back year after year. After my vomiting incident at World 100km I was making extra care to pay attention to how my stomach was feeling. With the Toad 'only' being 50km and a pretty fast course at that, I decided I'd prefer to be a little under hydrated rather than over hydrated with a sensitive stomach. So I took on Clif drink one sip at a time along with the occasional gel or shot blok. It was great to come past the start/ finish each time and have Bruce of Montrail hand me a fresh bottle rather than bother with cups at the aid stations. l be in the company of Andy on loop 3, even if he was looking decidedly fresher than I was feeling! I was on pace to maybe catch my course record from 2010 (3:37:33) and as I went into my 4th and final loop a volunteer gave me the extra push I needed by yelling at me that I still might catch my course record. Ok, 12.5km to go - I could dig deep for that long even on heavy legs and off I went, pulling ahead of Andy. It still didn't feel like I was running particularly fast (although the course was drier and in much better shape than muddy 2010!) but I was finally feeling a little more like I was in race mode. 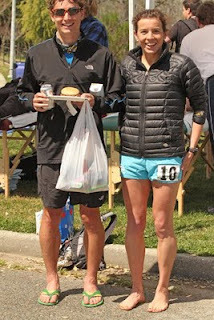 Top: Kristin & Ryne, happy post race! Below: With Glen Redpath - 4th overall, 3rd male, 2nd Canadian, 1st in age group! For a neat video clip that gives you more of an idea of what a wonderful event Peggy & George host, check out this link. It seems like every year I think I'd like to try squeeze in a few more shorter distance races but then another year goes by and I found myself racing Melissa's 10km here in Banff, my first 10km since the same race last year! Being it is one of only 2 running races held in Banff each year (the other being Winter Start 8km in November), I take part just as much because it's my home time race as anything else. Being in a National Park means it is often hard for event organisers to get permits for special events such as this in Banff but Melissa's has been held every year for the last 32 years and brings almost 4, 000 racers to town (for the 10km and 22km events), so is an annula tradition that brings lots of visitors to town for a final busy weekend of the summer season. So overall I had a fun time, I was joking that after my DNF at 90km a few weeks ago I can finally say that I have completed the 100km distance... it just took me 2 weeks to do so! I didn't have the energy to push really hard and especially found breathing hard with the cold. It was a suprisingly sunny and warm day too - 25 degrees! - which made it great to hang out after the race. I repeated my 2nd place from last year, despite running 20 seconds slower (on a slightly altered route) so I guess I can't complain too much. I started out fast. The course was 10 x 10km loops and the atmosphere lived up to all expectations. It was a-buzz at the start with lots of people around as it was also the Dutch 100km champs as well as there being a 50km race and a 10 x 10km relay. On the first few loops I soaked up the atmosphere of locals out cheering, many of whom had set up water and sponge stations in their gardens, or had opted to bring their lawn chairs out whilst barbequeing and cheering. Banners streamed over the streets and with a 10am start their were cheerers out right from the start. I aimed to hit 4.20 min/ km or so. Basically I wanted to run between 42min and 43km per 10km loop. This was ambitious and immediately put me out in the lead for the ladies field. I didn't especially intend to go out in the lead but I'd been prepared to take the lead if that is where my pace put me. By the 3rd loop I got even faster than this and appreciated when the GB crew told me to slow down. I'd simply got carried away and then on my 4th loop focused on checking every km split and soon reigned it in to a sensible pace. Ok, back on track I thought. The weather conditions were warm and humid, something I am totally unused to, in Banff the air is exceptionally dry and my final run in Banff before flying over for the race it had been a fresh minus 1. I knew I should take care to keep cool so was sponging myself at every opportunity and taking water form the kids along the side of the course between the two GB feedstations which were located at the start/ finish area as well as at the 5km mark of each loop. All still going well. Marathon in approx 3h01 and 50km in approx 3h37. The legs were still feeling good and no niggling pains were appearing. Awesome. A little into the 6th loop I began to slow. My stomach was beginging to feel a little off. Not awful, just not great. The eventual winner (of Russia) slipped by me to take the lead. Of course not encouraging but the bigger concern was my stomach and just a general feeling of wanting to sleep. I just felt plain tired. At 60km I pulled in to see Brian, Walter and Anne at the GB station. I told them I just wanted to stop. I had no energy. It wasn't that my legs were tired, it was just I didn't feel like battling on for 40km. Things had gone downhill quick and I felt like I didn't have my usual will to fight. The GB crew tried to get my going, they asked if I would regret quitting tomorrow and I said I knew that I would but I really didn't know I could carry on. I took off my bib and say down. I was done. Well, that's what I thought. After sitting for maybe 5 minutes the crew continued to talk to me and I knew I had to give it another shot. Bib back on and I was off before I could change my mind. My stomach was still not feeling great and I moved on as solidly as I could. 40 more kms didn't seem overly far but I wasn't in the spirit to push hard but I knew my race still had plenty of time to turn around. At 65km I pulled into the GB crew of Adrian and Peter. My stomach definitely didn't feel great now. They offered me all sorts of choices of things to eat and drink but none of it seemed remotely appealing at that point. Then my stomach turned and I vomited. 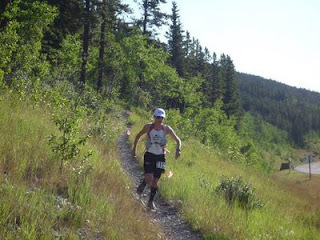 Having had this happen at Western States, I was actually quite positive about this - hopefully now I had a fresh stomach and could start getting on board new calories for more energy. It was also much harder to quit half way through a loop (though is was a still a tempting thought at this point). Ok, off I went again with a bottle of coke in hand which I drank in very tentative sips. Now I was running each 5km betweent the stations at a time. I would pull in, get a few words of encouragement as well as some coke and Clif drink on board and then would psyche myself up for another 5km. 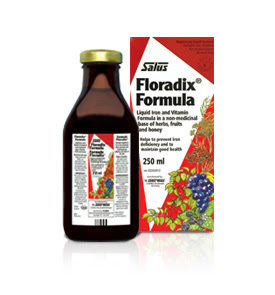 I was still at the stage that the thoughts of anything more than liquid was just not bareable, though I did force a gel at one point, knowing that any calories would help. At 78km I pulled over to the sie of the road and as I vomited for the second time a very kind Dutch lady came to offer me a baby wipe to blow my nose - much appreciated as I had no water to clear my mouth. Nice! Now I decided to stick entirely to flat coke. It was possibly my electrolyte drink that was upsetting my stomach (despite it being what I always take, the pounding on tarmac is never easy on the stomach). Just before 80km I ran past Jason Loutit of Team Canada. I told him it was getting tough but I was feeling surprisingly good and 20 more kms seemed totally manageable. I was delighted at the thought that I might finish the race under 8h30, not bad considering the things I had gone through. From 80 to 85km I took no walk breaks!!! Woo hoo!!! This was my first entire 5km run with no walking since 65km, and I was finding that although ladies were passing me as I would pull into the aid stations for a few minutes I would then gain on them again once I was moving. By now I had resolved to enjoy the race as much as possible and was waving at supporters and followed Amy's (Team USA) lead and high fived kids along the side lines. I am sure supporters wondered why the runner who had led the race for the first 50km was now so delighted to be close to an hour off the lead lady! I was just happy it was almost over and hopefully 1h30 and I would be done. But as I was at the 85km mark I didn't feel great again. It would be the final slump that I couldn't pull myself out of. My 5kms of running had zapped me and it was the first time that I walked out of an aid station. I tried to run but it was a short lived shuffle. I walked. I suddenly just couldn't run. Despite having switched to entirely coke my stomach was feeling upset again and the legs like lead, there was no energy left in them. From 85km to 90km it was a long slow walk, I maybe ran 500m (though it was maybe only 200m). I was done. Pam (Team USA) ran by and I was so touched when she told me to come with her. But I just couldn't. I would run maybe 20m and then grind to a stumbling walk. I crossed the start/ finish at 90km and then continued the few hundred metres to the GB crew. Just before then I met my Canadian friend Dirk who came to my aid as for a third and final time, vomiting ensued. I was definitely done. 10kms was just not possible. I was checked out. I could not believe I had been running so positively just 7km before, sure I would make it to the finish, and now I was a weak and stumbling mess. All in all - why did the stomach fail me? Who knows? I think the humidity is likley. 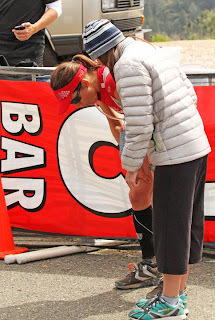 I am questioning the cleanliness of the sponges and the water at the aid stations. Other than that, it's hard to tell. Did I go out to fast? I'll never know. My stomach went before my legs had the chance to fail me. I personally don't think I did and I don't think my fast pace early on was the reason for my bad stomach. Other than that, I will admit, if I'd have been allowed I'd have run that final 10km later in the evening. I'm not planning on DNFing again. 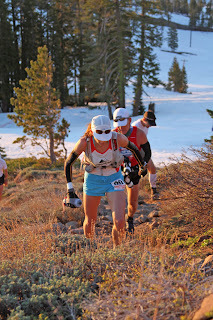 Thoughts of Anita Ortiz braving it out to a slow Western States finish this year kept me going for more than 20km. As Anita has said, 'I'm just not a DNF kinda gal', but I'l also have to concede that I DNF'd this one and Anita is even tougher than I can ever imagine. Absolute respect. After a big-hype race like Western it is always fun to get out to a low-key local race and just enjoy some fun times on the trails with friends and the trail community. That was what Powderface 42 was all about for me today and lots of fun it was indeed! It was just over an hours drive from Banff in the foothills near Bragg Creek, Alberta so I hightailed it out of work on Friday and shared fun time around the campfire that evening with friends. 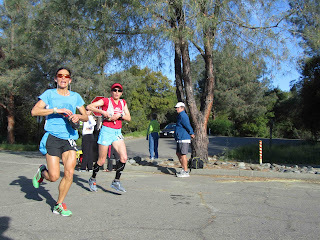 I was totally not in race mode, my legs have been feeling pretty heavy after WS100 and as half of our camping group were not actaully running the race, it wasn't the most motivating atmpsphere for a race - it was just fun times with friends. With the alarm going off at 6am I was still not in race mode and was wondering what on earth I had got myself into when I had eagerly accepted a spot at the race a few weeks earlier in a post-WS100 high. But of course by the time the shoes were on, a good cup of coffee down (thanks Nadja!) and then off to race start and chatting with fellow runners I was more in the mood to explore some new trails. And wow - what beautiful trails! It was soon sunny and warm, not a cloud in the sky and the trails were thankfully varied and had great views. Mentally I knew that 42km would fly by (it wasn't even an ultra!) and when I had a little wobble in my positive attitude on the long steep slog around the 18km mark a fellow Brit, Carl Price, who I have met at a few other racersaappeared out of nowhere at just the right time for some friendly company and chit chat to distract from the hardwork. But ok, I do admit I got a little competitive and when I saw my buddy Fitzy at an aid station with about 10km to go, I made sure I gave him a friendly elbow out of the way as I stormed up the hill (well, at leat until I was around the corner and could start powerhiking again!) The final 10km or so we passed half marathoners both on their way out and in (they had started 2hrs after the full) which was a great set up for us to all cheer each other on and motivate each other up the final few hills. And strangely enough it was one of those races where I swear my legs feel better after the race than they did before! Some aches and pains are gone, and sure - they are a little tired, but I somehow feel looser and less lead-legged than I did at the start line. Yay! Sunny fun times on the trails for sure, and a big shout out to the Powderface organisers (Bruce, Doug & team) and vollies who were just excellent for such a relatively small local race, as well Out There store in Calgary, the main race sponsors who made sure everyone went home with a nice goody bag and Mountain Hardwear race shirt. One final WS100 note: if you really want to hear more about my WS100 race then check out Running Stupid podcast with Ken Mical. Mel B congratulations! 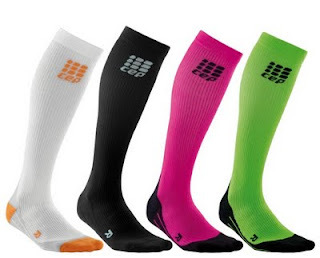 You have won yourself a pair of CEP compression socks or sleeves (your choice). As ever, this draw was conducted by my usual high-tech process of asking a friend to text me a number between 1 and 68 and I them counted down the comment list until I got to the winning number :) Photographic evidence of this draw selection process is below! Mel you were 56th down on the list. Mel B please email me at elliegreenwood@yahoo.co.uk and I will put you on touch with the folks at CEP for them to mail out your prize. Compression socks. Oh, those stylish knee-highs that either make you look like (a) you are back at school, (b) like you must be a sooper-dooper-fast runner, or (like me) (c) make you look like your legs are really short and this is why you don't play field hockey. But that said, with compression socks having being around the running scene for quite a number of years now they look like they are here to stay, and quite rightly so. As ever, with these things I will not go into all the scientific surveys that show improved circulation both during and after work outs, and increased blood flow and recovery, but I'll simply say that compression does seem to work. Although I will admit that I am yet to try my own scientific study which would be to run a race in one regular sock and one compression sock and see which legs feels better the next day ;) I'm seriously tempted to do this, except for the fact that I mostly wear compression for recovery rather than actual racing, although I have found the calf sleeves great in longer races as they provide the benefits of compression whilst still allowing me to wear my favourite socks on my feet. I had tried on various 'compression' socks in stores and was so so on whether they were worth the money. But last year I checked out the CEP booth at Edmonton marathon and finally found a pair of compression socks that seemed worth the investment. Firstly I was impressed that I got measured for them - I mean it only makes sense that you wear the right amount of compression, would you buy a pair of running shoes without getting your feet measured after all? And I can honestly say that I think wearing my CEP compression socks after Comrades and for the 22hrs of flying to get back home after was one reason my legs recovered so quickly after that 87km of tarmac pounding. So yep, I am delighted to now be on board with CEP and why not check out their site . As well as making compression socks and sleeves, I am excited to soon try out their compression shorts and the very latest product in their line - Clone - a pair of tights designed for recovery that are pesonally tailored for each individual after being measured in something like 41 points on each leg! And it's always nice to spread a little love, so if you would like the chance to win a pair of totally free CEP compression socks or sleeves please simply post 'compress those calves!' as a comment to this bost on my blog (not on my Facebook page). Entries will be drawn on Thursday 14th June at 5pm MST. Only for Canucks and Yanks, sorry to all others - I'll try have more give aways soon. Well I think even here in Banff we can finally say that spring is in it's way! It has been a long winter this year (it was snowing on my cycle into work yesterday, and although this morning the snow had stopped it was still a chilly minus 9) but slowly the snow is melting off the trails and the roads are looking pretty bare. So, if you had hung up your running shoes over the winter or were hibernating at the Sally Borden gym then now is the time to get OUTSIDE and RUN! A great way to keep you motivated is to join the new Lululemon Run Club. 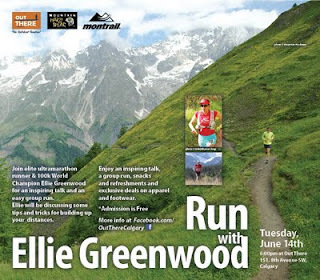 There will be an in-store info session at Lululemon (121 Banff Ave) on Wednesday 27th at 8pm, and then the first weekly run starts the following Wednesday (May 4th) at 6pm. So dust off your running shoes and come and join. All abilities (from total beginner) welcome, and best of all - it's FREE! EUGENIA! Eugenia, you have just won yourself a pair of Montrail trail shoes - yay! You were selected by a very official process of me texting a friend for a number between one and sixty-seven, and just in case I thought Jason might cheat and select his own number I then counted up from the bottom of the list rather than from the top - tee hee. For proof of this voting process - please see the picture below :) Eugenia - please email me your mailing address on elliegreenwood@yahoo.co.uk and I will get the voucher out to you (which you then mail into Montrail for them to mail the shoes to you). Ok, the race is actually called American River 50 miler but I had such a delightful 3 night stay in Sacramento for this fab race that it really needs to be renamed 'Awesome River'. My blog posts have been pretty infrequent recently as I've been laothed to post moaning-mini reports about trying to struggle through slushy yet deep snow, failing to find snow-free trails, and MORE fresh snow ... in April. So it was delight that I left Banff in the midst of a snowstorm on Thursday afternoon and about 7hrs (and a few airport sprints in my Montrail Rogue Racers) later I arrived in warm, palm-tree-blessed, sunny Sacramento. To make the journey even better by checked luggage arrived too (in Seattle, that had been in seriously in question). California oranges - now you don't get those in Banff National Park! Sacramento State Capital and PALM trees!!! My alarm went off at 4.10am after a night of tossing and turning. I hadn't slept well but felt rested and was relieved when the taxi I had booked actually showed up to take me to the race start. I was there pretty early but always like to have spare time for last minute prep and used the time to pick up some tips from volunteers who knew the course. I had checked out the desciption and the profile but it is always nice to get some specific tips, and I was glad to hear that the climb on the final 3 miles or so was really not as bad as it looked. At 6am we were off, it was barely getting light so in was beautiful to run as the sun came up over a misty and cool morning. Kami Semik and I introduced ourselves to each other at the start, we had never raced before but of course knew that we were each others competition, I checked around as I'd expected to see Tracy Garneau but noted that she wasn't there. The first 27 miles of the course are pretty much straight, flat paved bike path. Kami and I ran side by side for the first section just chatting along. I noted that we were hitting averages of about 4:15/ km which was a little faster than I had planned but it felt ok and although I had been warned that it was easy to go out too fast on this course I decided to roll with it. It was great to chat to Kami but I am not always very talkative when racing and didn't want us to push too hard to soon, so I dropped back and tailed her a little, hoping I wasn't being annoying by hanging on her heels, but really not wanting to stay side by side. The weather was perfect at this point, cool and crisp yet sunny and we knew it would heat up. I was relishing running in just shorts and a t-shirt, having been able to leave the bulky layers back in Banff. A couple of times the path rolled a little or we dipped into the trail a little but Kami and I were still together. At the marathon mark (we think it was a little short) we rolled by at 3h05 which I was happy with. Shortly thereafter we came to a major aid station at the end of the paved path at Beals Point. I grabbed my drop bag, took some extra shot blocks for my pack and carried on through. I was trying to drink from the stations by stopping briefly so I had my 2l pack with Clif drink for in between - yet hoping I could avoid having to waste time filling that. I was mostly eating shot bloks and realised why I routinely stick to the these, as I tried a gel I got about 1/4 of the contents in my mouth and spent the next mile trying to get the rest off my hands, gloves and everywhere - nice! Heading out of Beals Point I was glad to be done the tarmac, although it had been traffic free and scenic as it rolled right by the edge of the American River running on tarmac seems to pass so much more slowly. Although I had a relaxed and got into my run I was not feeling lost in my run and was concerned that I had maybe gone out too fast in trying to stay with Kami. As I looked ahead Kami seemed so much more relaxed than I felt. But now I could relax and enjoy it a bit, we had about 50km/ 30 miles in the bank and were hitting the trails where miles always pass so much faster and are more fun! The trails were awesome! They rolled up and down but no incline was so steep it couldn't be run. If I powerhiked it was a for a very short stretch before I either got back some energy or peaked at the top of the hill to run down. As I bowled along I suddenly felt like I was easing ahead of Kami. Before I had been ahead of her or she ahead of me but we were always at the same pace. Now I could feel that without intentionally meaning to I was pulling a little ahead. I decided to use this and make a break. We had 30km to go, she may well still catch me but if I could get a lead now and maintain it, it could help if I tired later on. The aid stations were excellent. By now, although I was energized, I was tired and so having aid stations every 5 miles or so I simply ran from one to the next. I would pause, get on board some coke and chips and energy drink, and carry on. If I ever I was tempted to stay long or hike a hill, I didn't dare - I had no clue how close, or far behind, Kami was. As I got into the last 20km and then 10km, I was working hard. My legs felt like they were seizing but I just kept pushing knowing that every step I took and the faster I took it, the closer I was getting to the finish line at Auburn. I'd been keeping an eye on my Garmin for pace and knew I was doing ok but I was also aware that I was bound to slow on the steep hill in the final 2 to 3 miles. At this point, the views were fantastic, I was passing a few men, and people were encouraging me at the aid stations but I really took little of this in. It was head down and push forward. I had to laugh as I had seen photos of this section of the course from when my friends Leslie and Keith had run it a few weeks prior, and although I was enjoying myself I could only think how much more they must have enjoyed it as a leisurely training run and having the opportunity to soak up the surroundings. The final hill came, and not a moment too soon. I had been told that about 1/4mile was a hike and the rest was runnable, which was great info to have and pretty spot on, I even thought that the 1/4 mile was short! In the runnable section (now I'd hit tarmac again) I would walk a few steps only to force myself to run - get this done, and don't let Kami catch you! Scott Jaime was just in eyesight in his Pearl Izumi t-shirt ahead, I looked up and just focused on not losing ground on him. For the final 2 miles there were mile markers which seemed 2 miles part, but as I hit the final 1/2 mile I knew I was near the finish as I could hear the hubbub of the finish line. By now it was flat, so it was push to the line and - wow! 6:25:42. I was done. Kami came in 9 minutes later looking much more calm and collected. I soon realised why the last section had been so tough, being unused to heat I had not taken on enough salts and was seizing seriously. Without wanting to seem too much like a prima-dona I was escorted to the massage table by 3 men helping me with my gear etc. I knew I had to get electroltyes back on so before I got on the table I downed some coconut water. Felling a little better I now tried to get off my shoes and that was when all agony broke lose in my right calf - aaaaaaargh! Well, if I was going to cramp big time, having someone to hold me up and a massage therapist to work my calf was a good time to do it. Needless to say the massage wasn't pleasant but was definitely just what I needed (along with lots of salts and liquids). I am really happy with my time. It is good marker to see where I am at and I have never run a 50-miler this early in the year. 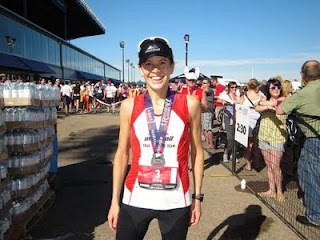 It's great as a marker for Comrades and Western coming up, and a big lesson in running in warmer temperatures (because I am fully aware that it wasn't actually anything like hot!). It was also great experience to run side by side with a competitor for so many miles, great mental training and experience, as well as an absolute pleasure to share the experience with Kami.